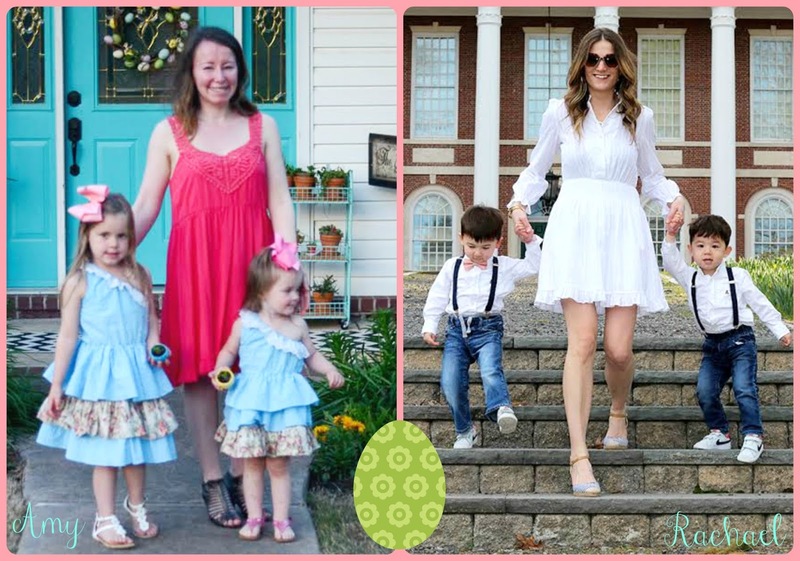 I have fond memories of Easter growing up--finding the perfect outfit to wear to church (I would simply ask myself, "What would Claudia Kishi wear? "), hunting for Easter eggs on Easter morning, and dyeing hard boiled eggs the night before. However, I can't think about Easter as a kid without remembering one of our neighbors and their overly-extravagant Easter celebrations. We kept things pretty low key at my house. My biggest thrill was finding a whole dollar in one of the "big eggs," aka one of those old pantyhose containers. Otherwise it was mostly candy, quarters, and maybe a small gift or two, and I absolutely loved that. When we moved to a new neighborhood one year, we didn't know just how much entertainment we would be getting every Easter. 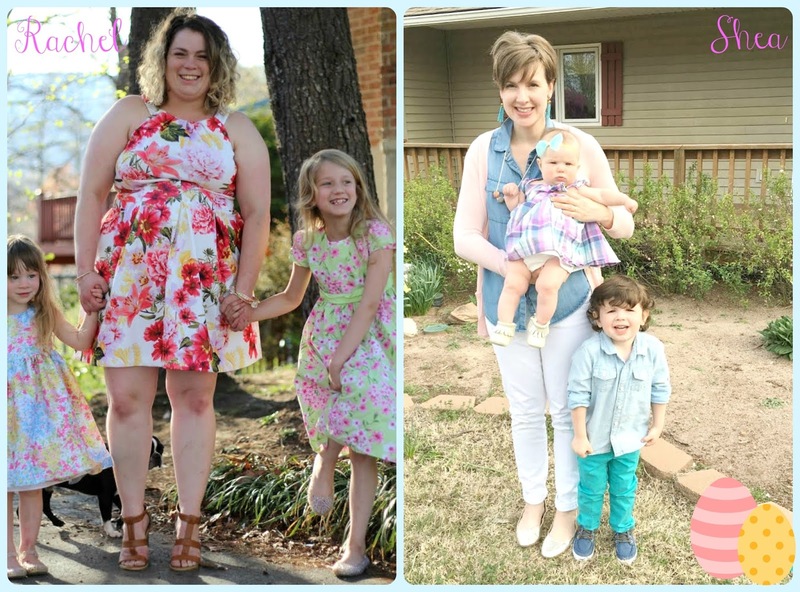 These people staged elaborate egg hunts in their front yard, and I remember seeing GIANT Easter baskets in their tree and thinking, "How the heck did they get that thing UP there?" I remember being nearly as excited to see just what kind of stuff was "hidden" in their yard as I was to see what was in my own Easter basket. I never felt jealous, mind you, I was genuinely entertained by how much money and effort went into those festivities across the street! Now that I have kids of my own, I love creating new holiday traditions with them. We don't have a lot of Easter traditions just yet, but we definitely want to make the day memorable for them, even if our neighborhood doesn't offer quite as much in the way of Easter entertainment. I'm joining some fabulous bloggers today for a special family Easter post today, so be sure to check out their blogs to read about their Easter celebrations. 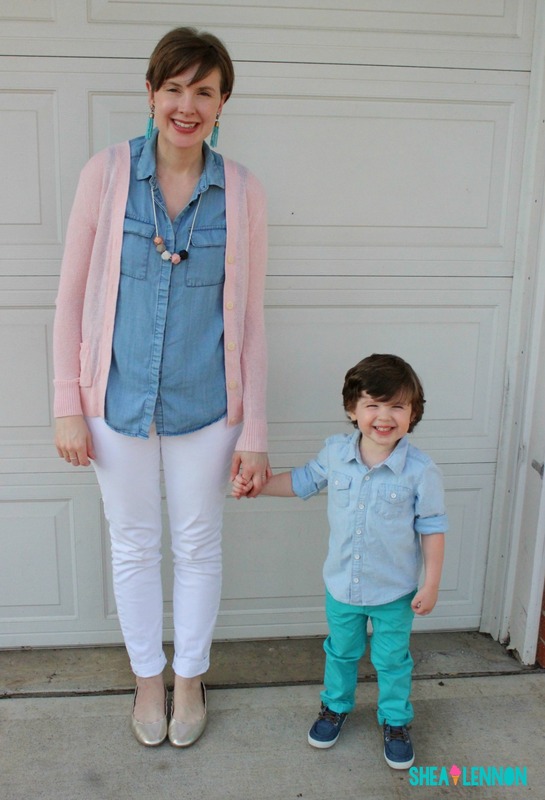 "This Easter, Aubrey and I will be wearing everything used! Missy A is wearing an outfit that was handed down to her by some sweet friends of ours whose daughter is a year older and have been so kind as to pass all her outgrown clothes on to us. She loves these baby doll style of shoes and gets really excited when she gets to wear them. You may recognize the dress I’m wearing from last year’s mommy & me collab! 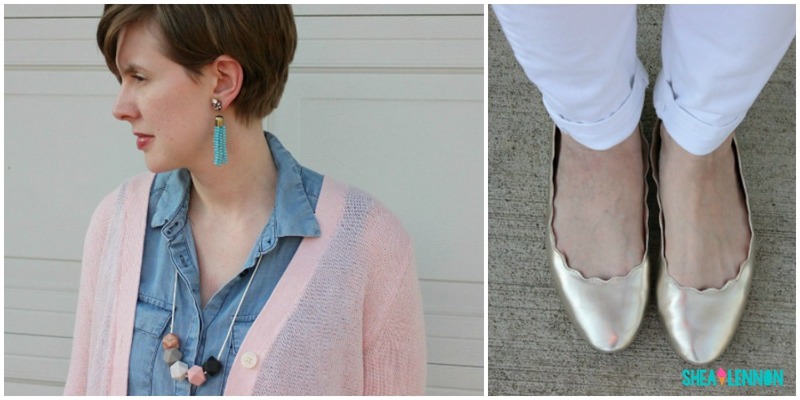 Since this year I have resolved to add nothing new to my closet, I’ll be sporting this casual favorite of mine in a new way as we celebrate the day with family." 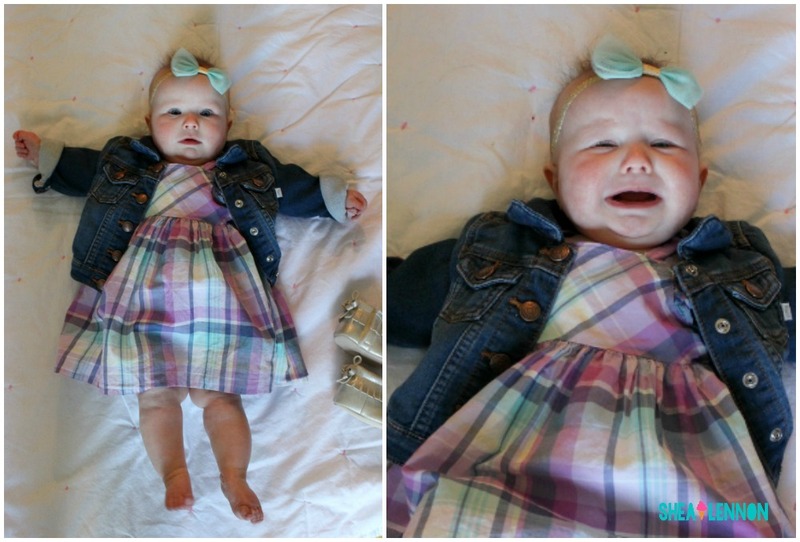 When Jona was a baby, we started going to the sunrise Easter service at our church. We liked the idea of beating the crowds (our church is very big, and extremely busy on Easter), and usually we were up and around anyway. Since then, we've made it a yearly tradition to go to the early service, even when it snows, like it did last year. Even though our church is pretty casual, I still like to get a little dressed up and coordinate our outfits. 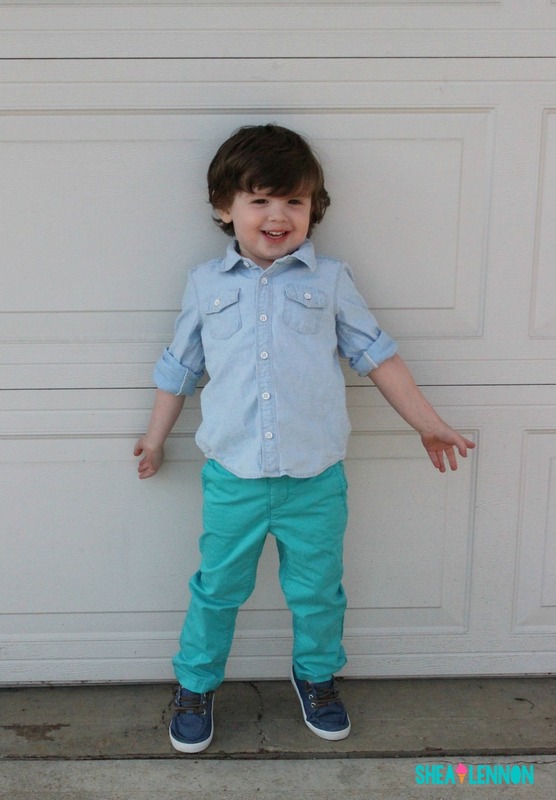 While I often wear something I already have, I have a lot of fun shopping for Easter outfits for Jona and Violet. 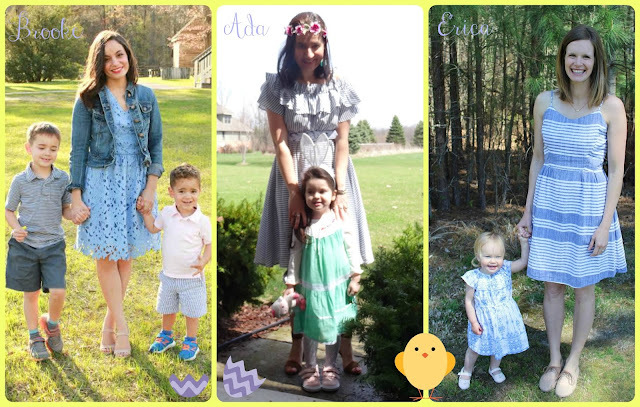 This year was no exception, and since we got some family photos taken with Aaron's side of the family last weekend, it was all the more reason to find some cute, coordinating looks. I may end up wearing this chambray dress instead of white jeans for a look that's slightly dressier. After church, we come home and see if the Easter Bunny has hidden any eggs and put anything in the Easter baskets. I think Jona will really love hunting for eggs this year, and we won't have to put them in only the most obvious places. Of course, he'll gladly hunt for Violet's eggs as well. Inside the hidden eggs, I put small candies or crackers. I don't go too crazy with Easter baskets, usually the Easter bunny just brings one toy and one book (often Easter-themed). As the kids get older I want them to understand what Easter is really about, and not be overly focused on the gifts. 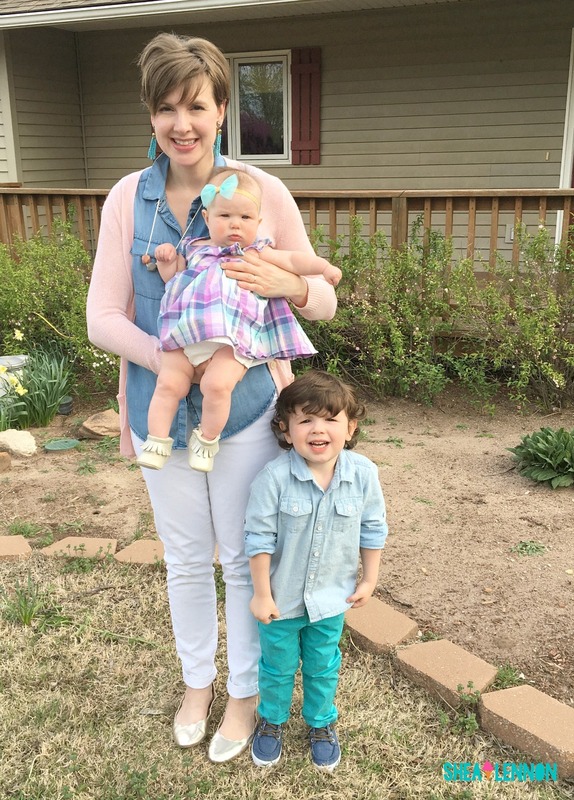 I love creating holiday traditions, and I hope that Jona and Violet will have wonderful memories of Easter just like I did. What are your family's Easter traditions? 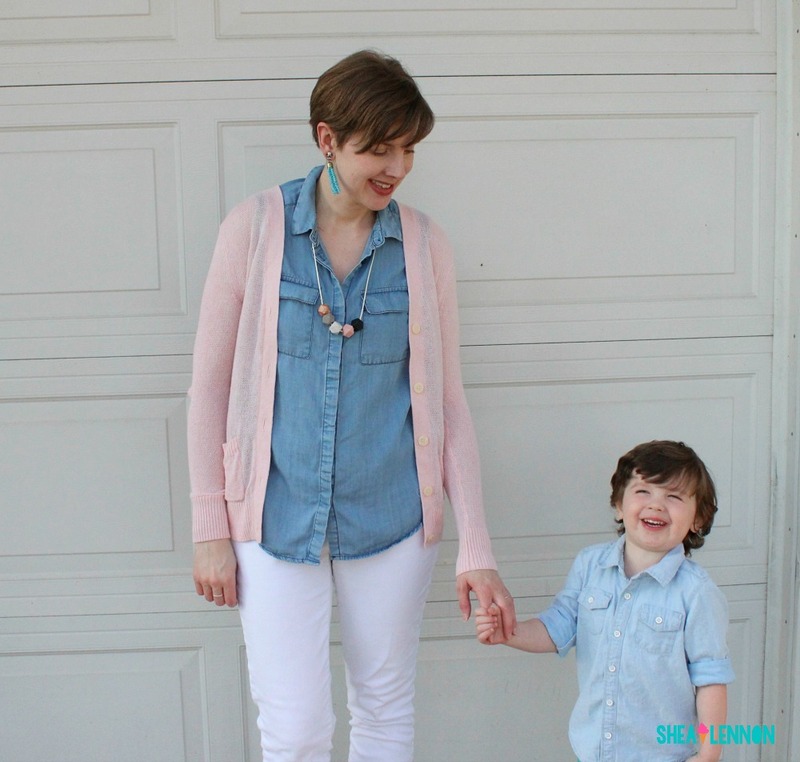 Linking with Pumps and Pushups, Elegance and Mommyhood, and Carrie and Jill.